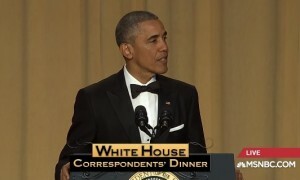 President Obama at the 2016 White House Correspondents’ Dinner. Photo: Screenshot. New York Times – President Obama and his family plan to move to a mansion in the upscale Kalorama neighborhood of Washington, a mere two miles from the White House, when he leaves office in January, according to people familiar with his plans.